A common misconception with covering ones heater is that by using a metal cover, the metal will radiate the heat. This view is common because yes, metal is a conductor and wood is an insulator, therefore the intelligent conclusion would be that metal is better. The problem is the application of this information. In the case of a heater, heat is transferred directly from your heating element or radiator to the air directly. Air is tranferred into the room by the process of convection. Cold air is heated by the heater and because the molecules are now more enegetic, they expand, becomming more bouyant than the surrounding air. Your heater cover acts only as a chaber to contain this flow of air and dirrect it out into the room. This process is the same way weather paterns work on Earth. Because wood is an insulator, the wood covers will not heat up as much as metal, adding an element of safety to prevent little fingers from burns and worse. Wood looks better when creating a piece of furniture. Wood being easier to work with allows more flexibility in design. Wood is easier to repair when damaged. Most people have no problem fixing a nich in a piece of wood trim, but would never attemp to repair a dent in their car. This makes future maintainance much easier! Wood is quieter. Wood will resonate sound like metal. Wood being an insulator also insulates sound better than metal. Have a noisy heating system? Wood will mask this noise better. Wood composite have more of a quality feel than a thin sheet metal cover. 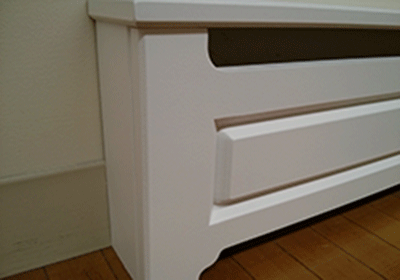 A wood cover is a piece of furniture. A commonly overlooked step in babyproofing your home is covering your heaters. Large cast iron heaters not only pose a general burn risk to little ones, but when they are in close proximity to furniture, they pose the risk of trapping children with horrible results. 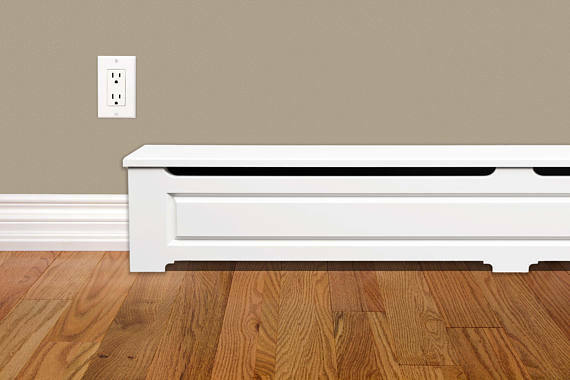 Baseboard heaters get hot enough to burn, but also pose a safety risk due to the sharp parts. The best solution is to cover up your heaters with a quality wood cover. Wood is an insulator which unlike metal will not heat up enough to cause burns. At Jay's Custom Cover's we have quality heater cover solutions at a great value!. We still have a bit more work to do, but the new site is finally live!